Merry Christmas, folks! I hope everybody is enjoying the craze like I do, even if I didn't get any toys this year. But my brother did (it's actually my twin brother). And it filled me with joy, as I saw him filled with joy, holding his brand new MotUC She-Ra in his hands yesterday evening. I guess this is what the Christmas spirit should feel like, right? Well, let's take a closer look at the character and latest She-Ra action figure from Mattel then. 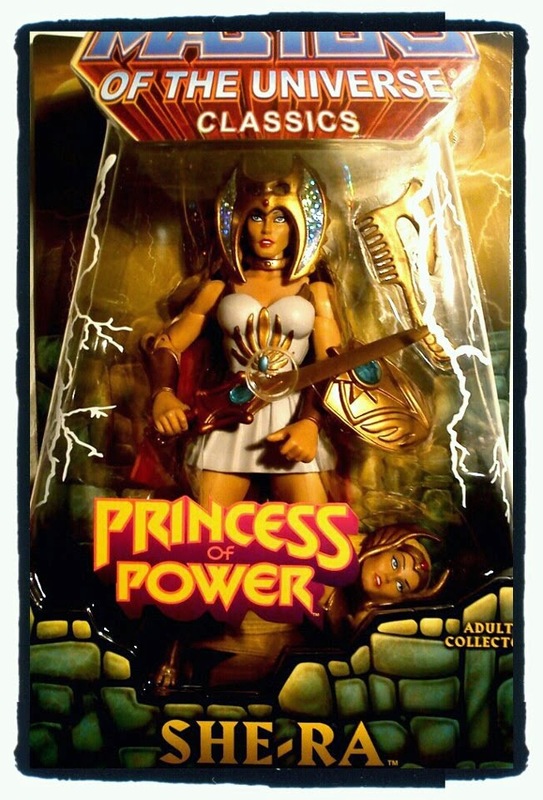 She-Ra and the Princess of Power (PoP) were originally introduced in 1985 as a spinoff of the successful He-Man and the Masters of the Universe series. She-Ra was supposed to be the twin sister of He-Man (what a coincidence! ), fighting Hordak and his Evil Horde (the former mentor of Skeletor) on a planet named Etheria. In The Secret of the Sword, the animated MotU movie, She-Ra had her first appearence: Here she gets kidnapped by Hordak as a baby and raised up on Etheria for being put on command lateron as captain of his Evil Horde. One day, He-Man is sent to Etheria on a mysterious journey, to return a magic sword to its yet unknown owner. When he arrives on Etheria, he gets captured by the troops of Captain Adora, which of course is the long lost twin sister of He-Man. With the help of Grayskull, He-Man can finally reveal her true identity to her: The owner of the magic sword He-Man has brought to Etheria is Adora. The PoP series ended already in 1987 and could not compete with the success Mattel have had with He-Man and MotU. Anyways, since She-Ra and PoP are integral parts of MotU and 80s' pop culture, Mattel decided to release a new She-Ra action figure as part of the MotU Classics line. 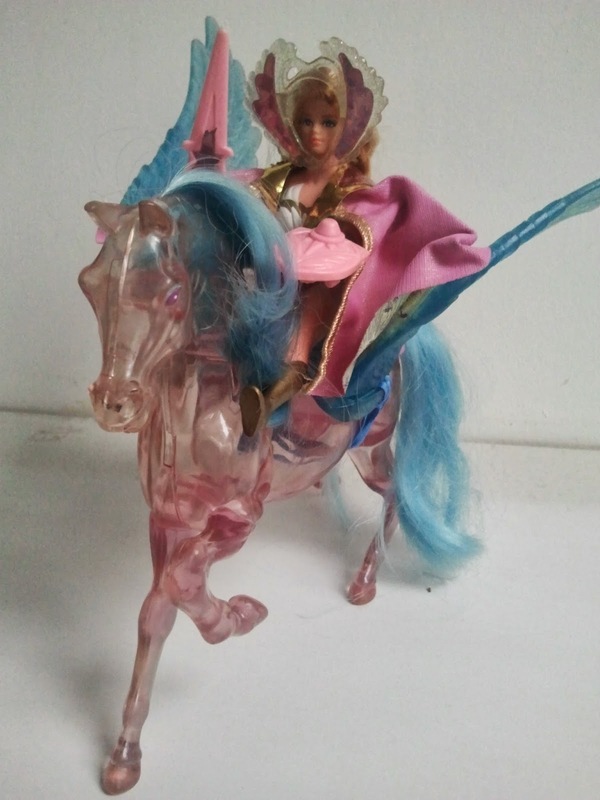 The MotUC She-Ra comes in her typical, white-golden dress, with a sword and a shield, and two interchangeable heads, one based on She-Ra like shown in the animated series, and the other one based on the vintage action figure. In my opninion, it's definitely the best She-Ra / PoP action figure that has been released (so far). Indeed, the 80s PoP figures were no real action figures. 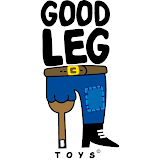 They were dolls for girls (and my brother lol), that had combs as weapons and some gay looking glass horses as battle vehicles. Even the 200x She-Ra exclusive was too much of a girls doll.